1 Model, 10’ 4” Cutting Widths: The Case IH TD102 pull-type disc mower features a smooth ride, clean cut, superior trailing ability, low transport height and easy tractor hookup. Tilt is adjustable from 2–10 degrees using a mechanical turnbuckle. Attaching and detaching the mower from the tractor is easily accomplished with a simple clevis hitch . The TD102 can be pulled by lighter-weight tractors , as weight is pulled versus carried on a 3-point hitch. 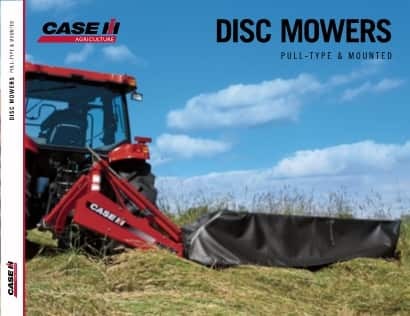 The Case IH TD102 pull-type disc mower features a smooth ride, clean cut, superior trailing ability and narrow transport width, plus easy tractor hookup using a simple clevis hitch. Configure and price your new pull-type disc mower. Customize it the way you want. Compare our pull-type disc mower specs to other manufacturers' specs.